This page of verilog sourcecode covers HDL code for 1 bit comparator and 4 bit comparator using verilog. Following is the symbol and truth table of 1 bit comparator. 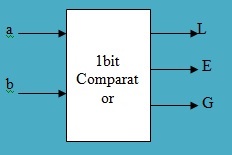 Following is the symbol and truth table of 4 bit comparator.